Sharon Sims reacts as she is introduced to the homecoming crowd during Wilmington College’s Hall of Fame induction ceremony. She is flanked by, from left, Chad Garman, an inductee for men’s soccer; Greg Morrow, track and field; Kelly Peters, women’s basketball; and Jay Slouffman, men’s basketball. 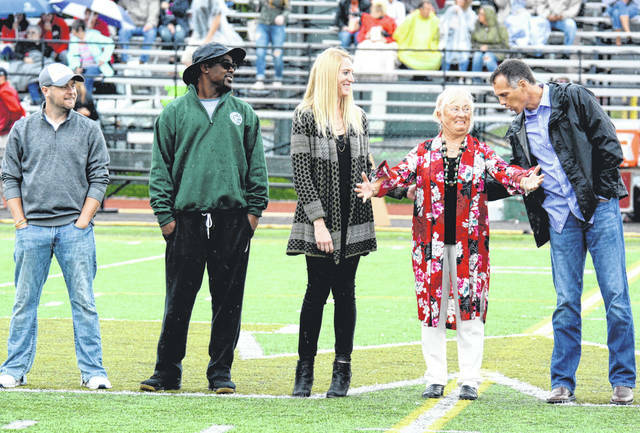 Sharon Sims was recognized as a pioneer of women’s athletics when Wilmington College inducted the Greenfield resident into its Athletic Hall of Fame during WC’s homecoming weekend. The 28th induction class inducted a trio of All-Americans; a basketball record-holder; and the legendary mentor, Sims, who coached five sports during her 34 years at WC, in addition to being on the faculty and serving as an athletics administrator. Sims was a builder of women’s sports at Wilmington College at the dawn of the Title IX equal opportunity initiative. She coached women’s basketball for a dozen seasons from 1978 to 1990, amassing 117 victories including, in her final season, a then-program best 18-win campaign. Three days after being hired to join the college’s health, recreation and physical education faculty, she was asked to coach volleyball. While she played field hockey and six-player basketball in college, she became a student of the game of volleyball, the same as she did when asked to teach golf, the sport for which she developed possibly her greatest passion and prowess. To this day she owns and operates Sims Family Golf Center near Greenfield. Sims started the WC women’s golf program and coached it for a decade, being named Ohio Athletic Conference Coach of the Year in 2004. The LPGA-certified teaching professional introduced that sport to or honed the skills of hundreds who took her popular physical education class. In addition to coaching volleyball for four seasons, she coached women’s track and field for three years and men’s and women’s swimming for three years. Also, in addition to being a member of the faculty for 34 years and retiring as a full professor, Sims served for many years as assistant athletics director and senior women’s athletics administrator. Sims, who was presented at the ceremony by longtime friend, Suzanne Irvine Sharp, described her induction as a “very meaningful and extremely humbling” honor. She spoke about receiving a bracelet with five charms representing the five sports she coached at WC. “Those five charms represent a multitude of precious memories,” she said in recalling the “tremendous journey” she had at Wilmington College. “My athletes and I, over the decades, shared and learned together. We ate our meals together, traveled together, laughed and cried together, and yes, we won and lost together. Randy Sarvis is the director of public relations at Wilmington College. https://www.timesgazette.com/wp-content/uploads/sites/33/2018/10/web1_HOF-SharonSims.jpgSharon Sims reacts as she is introduced to the homecoming crowd during Wilmington College’s Hall of Fame induction ceremony. She is flanked by, from left, Chad Garman, an inductee for men’s soccer; Greg Morrow, track and field; Kelly Peters, women’s basketball; and Jay Slouffman, men’s basketball.